Gleaming Glass offers both traditional window cleaning and modern services. There are some cases where the windows are really hard to reach in a safe manner. In those situations we use a water fed pole. A water-fed pole is a modern, safe way to clean windows. Traditional methods are considered to be the cleaning of a window through the use of traditional tools. Tools like the strip washer, squeegee, and detailing towel. This method of cleaning is considered traditional because it existed before the water-fed pole was introduced. It’s what window cleaners have been using in America, and across the world for the last hundred years. 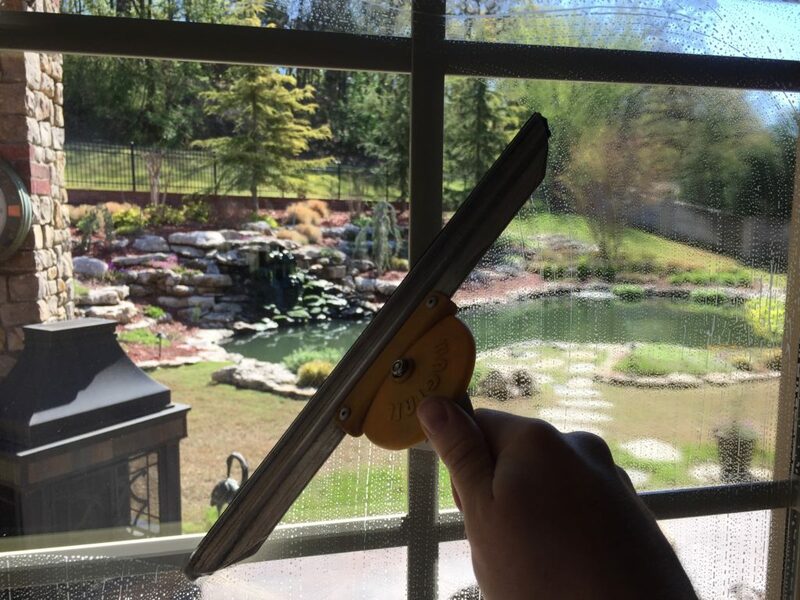 Ever since the water fed pole was introduced and pure water window cleaning was proven to be a more effective method for cleaning exterior windows, and more window cleaning companies are beginning to switch over to water fed pole technology for the cleaning of exterior windows. Traditional methods are still necessary for the cleaning of interior windows. Water fed pole technology uses a lot of water to scrub down the glass. Obviously, this method isn’t feasible for the cleaning of interior windows. There is too much water being used. Obviously, using this much water inside a house wood prune a lot of things such as electronic appliances in wooden furniture or floors. So, window cleaning companies still need to utilize traditional window cleaning methods for the interior cleaning of windows. To start off the cleaning process, we apply a special cleaning solution to a strip washer. We scrub down the glass to loosen up any dirt or debris that have bonded to the glass. Once all the debris and dirt have been suspended in the soapy water, the next step is to squeegee off the dirty water. We then detail the edges and corners of the window. You can recognize a professional window cleaning company by whether or not they detail the window. Not every window cleaning company in Tulsa does this, and it’s typically the window cleaning companies that offer Tulsa storefront window cleaning services. Traditional methods are currently the only method available to clean interior windows. Even though all of the soapy water has been squeegeed off the glass, there is still a fine layer of soap film left behind at a microscopic level. If you were to look at a window or piece of glass with a microscope you would find that the Glass is not completely smooth. It has a porous surface. The soap gets trapped in the pores as you glide over them with the squeegee. Most of the soapy water gets removed, but it is impossible to remove all of the soapy water. This soapy film that is left behind on the glass, actually acts as an attractant to dust debris floating in the air. This is why the new and improved modern window cleaning methods do not use soap. With these modern window cleaning methods, soap is not utilized in the cleaning process. When cleaning with a water fed pole and pure water technology, you are using nothing but pure water to clean the glass. Simply scrub down all the dirt with a brush and rinse the dirt off of the window with the pure water. After the water has evaporated you’re left with nothing but glass. Meaning, there is no soapy film on the glass to attract dust and dirt. This is why modern water fed pole window cleaning methods are more effective than traditional window cleaning methods. Unfortunately, no one has invented a way to use the water fed pole inside a customer’s home when cleaning interior windows.